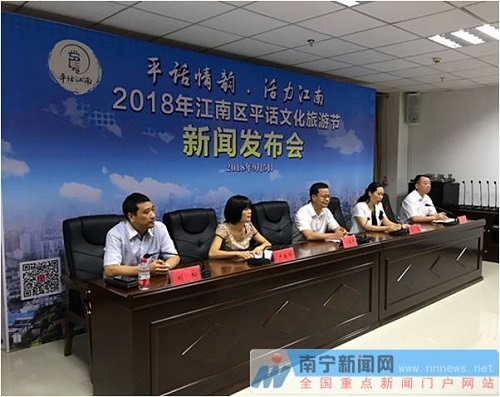 Lately, Jiangnan District of Nanning held the press conference on holding the "Pinghua Cultural Tourism Festival 2018" at Jiangnan District People’s Government. By report, the "Pinghua Cultural Tourism Festival 2018" will continue to be themed on "Charming Pinghua · Dynamic Jiangnan", and hold a series of events such as "Show · Jiangnan", "Travel · Jiangnan", "Sing · Jiangnan", "Taste · Jiangnan" and "Buy · Jiangnan" at Rongsheng Tianhe · Marine Joy City and Nanning China South City in Jiangnan District, letting the mass enjoy the culture and tourism feast of Jiangnan District and the fruits of economic and trade cooperation events through the opening ceremony of Pinghua Cultural Tourism Festival and various cultural and recreational experience. Besides, there will also be introduction events for business attraction, Pinghua folk song parties, and folk activities in Yangmei Ancient Town waiting for you.